The first round of Heineken Champions Cup games are in the books. The round had it all; last gasp drama in several contests with some unbelievable performances for all the good and bad reasons. Hawkeye Sidekick reflects on the action. It might be only one round into the competition but that Leinster Rugby performance last Friday night particularly second half will have put all opponents on notice of the levels required to even compete with the Irish provincial juggernaut. I do not use the word juggernaut lightly; this side is stacked with world class talent and then the squad depth coming off the bench in the third quarter with the likes of Jack McGrath, Sean O’Brien and Scott Fardy. Wasps were facing an uphill task without the Nathan Hughes and Joe Launchbury but both players would have struggled to stem the tide of Leinster attack after attack. Wasps manfully tried to keep in the contest but once Luke McGrath scored that try just before half-time, the writing was on the wall. Skill set central came out in the second half. Sexton’s pass between the legs. Furlong playing like a season three quarter and his pop pass to James Lowe who is playing at a different level was an action reel highlight. The relentless nature that Leinster Rugby continued to work the scoreboard was an ominous sign for all in Leinster Rugby’s pool. Toulouse and Bath Rugby will be sufficiently warned. A superb start to the competition. Two games come to mind here. The after effects of Storm Callum had a massive impact in the South West England and West Welsh region. Two of the games held in these regions were standouts; the quality of fare immense given the atrocious weather conditions. Howling wind and rain and Exeter Chiefs / Munster Rugby along with Scarlets / Racing 92 provided superb entertainment. Exeter Chiefs and Munster Rugby was an old school arm wrestle. Neither side gave an inch. Munster Rugby worked the Exeter Chiefs tackle count, kept the ball in hand and must be complemented for their opening period performance playing against that gale force wind. Exeter Chiefs showed their potency with their try; superb pack. Jack Nowell on the wing was a constant menace. Munster Rugby struggled to breakdown a resolute Chiefs defense but credit the sub bench impact here. O’Donnell’s ball carry prior to Stander’s try was top notch. The front row replacements steadied a scrum set piece which looked to be going away from Munster Rugby. I thought James Cronin and John Ryan had powerful cameos. Ball handling issues and there was some soul destroying concessions when in range to score. Cloete’s disallowed try a perfect case study point. Exeter Chiefs to their credit refused to buckle and when Joey Carbery kicked the ball out on the full with minutes left, the scene was set for the hosts to win with a last gasp dropped goal or penalty. Credit Munster Rugby, the defensive shift at the end, camped on their own line and forced the error. A draw was a fair result. The return fixture in January looks epic already. Total ball break for Scarlets late on conceding a late penalty try to Racing 92. The game ebbed and flowed throughout. Both sides absorbed what the other threw but it looked like the hosts had done enough but Racing 92’s front five put the pressure on and unfortunately for Scarlets, they were unable to respond. Leigh Halfpenny had opportunities but the windy conditions made kicking a lottery. Incredible drama. Scarlets are suddenly in playoff rugby mode; need a win over Leicester Tigers next weekend. Freddy Burns has had enough from the keyboard trolls this weekend for his horrific lapse against Toulouse so I am going to focus on RCT Toulon. How anyone in the RCT Toulon ranks thought with three minutes left to not go for the posts needs their head examined. I thought it smacked of arrogance and contempt for their opposition, delighted that Newcastle Falcons won thereafter. A superb triumph for Newcastle Falcons, a win to build the season around now. RCT Toulon are spiraling into the abyss this season; their lack of game management and leadership striking today. Glasgow Warriors. They played all the rugby today against Saracens but were unable to break down a resolute Saracens side. The refereeing for me left plenty to be desired; the constant penalty concession by Saracens before half-time and no yellow card was weak officiating. The Itoje incident is something that come back and haunt the England international yet this season; cheeky move and one that Glasgow Warriors should put on their dressing room wall for the return leg. Itoje needs to be careful; discipline is becoming an issue with the player and this antic (if seen by some as hilarious) will only put the spotlight further on the player. Glasgow Warriors were exposed in the pack battle; when they required go forward ball, they did not get it from their front five and that ultimately cost them the game but there sufficient evidence here that Glasgow can get back into this pool starting with a now tricky encounter against Cardiff Blues who had a superb 21-30 road trip win over Lyon who may give up the ghost on this competition. An interesting pool awaits in pool two with intense pack battles the order of the day with Munster Rugby, Exeter Chiefs, Gloucester Rugby and Castres in the mix. Hawkeye Sidekick previews the pool and has genuine concerns about Munster Rugby this season. When you consider Munster Rugby’s season so far, it reads played six; won three (all at home), lost three (all away). The road trip performances have seen the Irish province leak thirty plus points and there is no quick fix in terms of the defensive issues seen so far. The scrum half injury crisis could be a decisive blow as well with star player Conor Murray not in contention to play in the competition’s first two rounds at least. The home form will need to be on point to progress but nothing will be taken for granted. Exeter Chiefs look best equipped to take advantage of Munster Rugby vulnerability. Their imposing pack has being their foundation and their ability to turn penalty count to tries using their marauding maul is a source of great concern for their pool opponents. Exeter Chiefs under Rob Baxter have also evolved their game plan with Jack Nowell, Henry Slade and Alex Cuthbert resulting in some very impressive score tallies. The home form in Sandy Park will be strong; question mark on the road trip form which did lag last season so an interesting subplot. Gloucester Rugby make a welcome return to the competition; an incredible rugby town and knowledgeable rugby support. The Shed will be hopping for this tournament. Gloucester Rugby are evolving into a very competitive side; their expansive play seen to full effect last season and with their acquisition of Danny Ciprani, the attacking options are endless with an extremely pacy back three (Marshall, Trinder, Sharples). A team which has recruited well in the pack with a strong South African influence. Grobler at lock has all the attributes to be a sensational signing. A team to be feared and their home opener against Castres will gauge morale and confidence of pool progression here. Castres. The great enigma of European Cup competition. When they are interested (more than likely at home), they can cause massive issues for travelling teams but their policy of fielding below strength sides on the road will mean that the French Top 14 kingpins will languish in the mid-pack. An opportunity perhaps for the other pool teams to secure five points in their home games? The hope is that we will see some exciting contests but who am I kidding, the arm wrestle games will be a key theme and start with the Exeter Chiefs home opener against Munster Rugby. Potentially two teams to advance from this group given that Castres may travel light on the road. 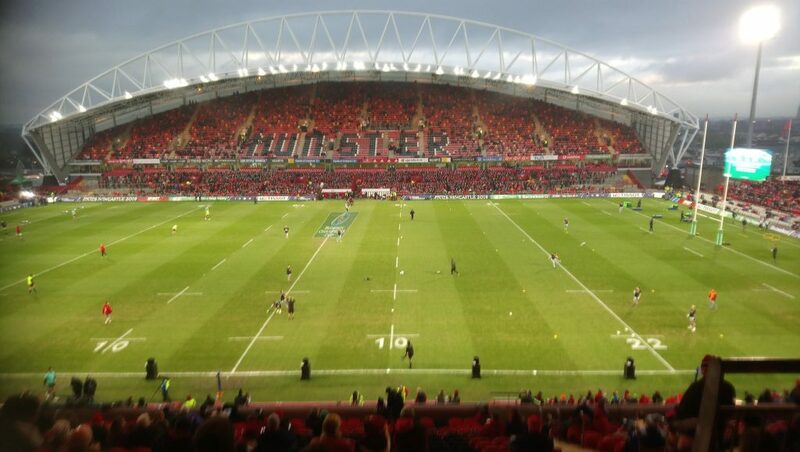 Munster Rugby look vulnerable here and suspect a last round miracle may be required to advance as a pool runner up. Exeter Chiefs for me look the form side in this pool. Plenty of twists and turns in this pool.